After so much confusion about the JIO’s Summer Surprise Offer Ending date, after TRAI (Telecom Regulatory Authority of India) advice / directives . 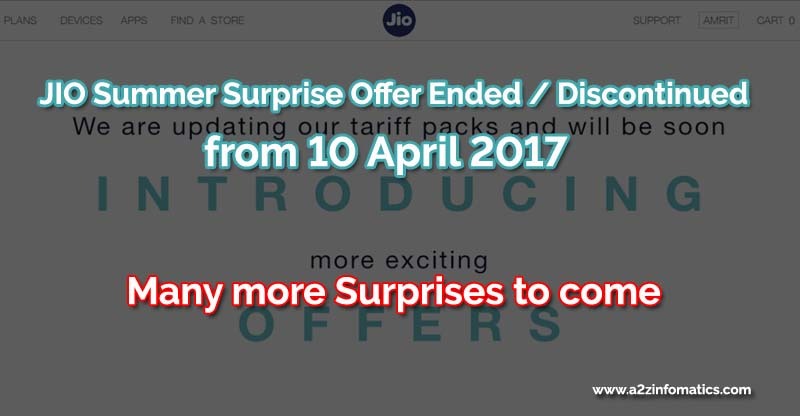 Although there is no official announcement about the discontinuation of JIO Summer Surprise Offer, but there are strong signals that the Jio Surprise Offer has been ended / discontinued from 10 April, 2017. Earlier, many related experts has pointed out TRAI behaviour on JIO’s Summer Surprise Offer. They revealed that there isn’t any provision to issue an advisory under the TRAI act. In simple words, the regulatory experts are blaming TRAI about not using their granted powers, to stop Jio Summer Surprise offer immediately. JIO Summer Surprise Offer ENDED / Discontinued dated 10 April, 2017. Update: JIO Happy New Year Offer is ending on 10 April, 2017 Midnight. Actually, any common man can never understand the actual happenings behind the scenes. Let’s move step by step to get any clue out of it. Today, the Telecom Regulatory Authority of India has advised Jio to withdraw the 3 months complimentary benefits of JIO SUMMER SURPRISE,” Jio said in a note. “Jio accepts this decision. Jio is in the process of fully complying with the regulator’s advice, and will be withdrawing the 3 months complimentary benefits of JIO SUMMER SURPRISE as soon as operationally feasible, over the next few days. Here the TERM “as soon as operationally feasible” was the master punch by JIO. Nobody got any clue about the used “next few days” term in the above statement. Big people, Big Minds 🙂 . 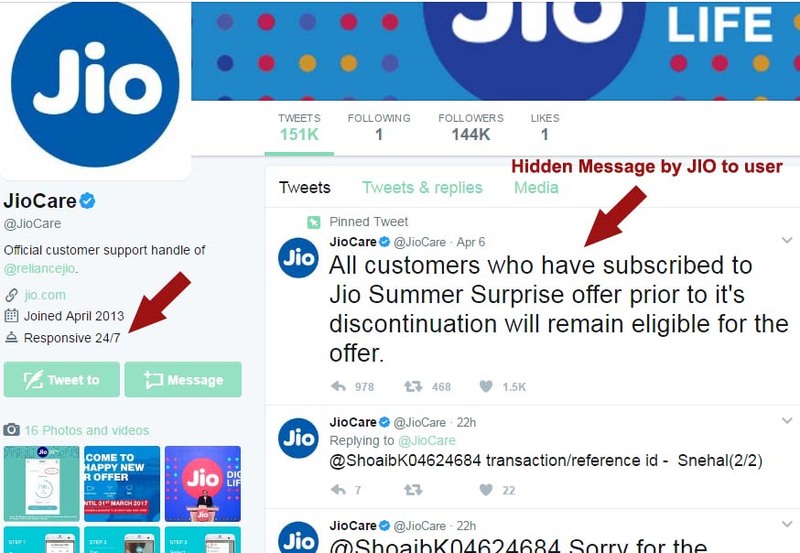 7 April, 2017: Everybody thought the JIO’s Summer Surprise Offer will be discontinued from 7th April 2017 midnight as of TRAI’s reputation. People thought this is their last chance to grab this wonderful 90 days free data offer. On this day, JIO’s Summer Surprise Offer was the talk of the town, people were crazy to get their JIO number recharged with the Prime + Rs 303 (or above) to avail Summer Surprise Offer. 8 April, 2017: Although the majority of the people got enrolled into the JIO Summer Surprise Offer on 7th April 2017 itself. People who have missed to enrolled were feeling disappointed. This disappointed haven’t lasted long, after getting JIO care SMS saying “the offer is still available” 🙂 🙂 🙂 . DO JIO Cares for the helpless TRAI 🙂 ???. 9 April, 2017: From last few days happenings, people were sure that the JIO’s Summer Surprise will be available on this day too. Yups, they were right, the Summer Surprise Offer was available to OPT on 9th April 2017 too. 10 April, 2017 (Today): Oh my GOD, JIO’s Summer Surprise Offer is vanished from the JIO Website (www.jio.com) without any official statement. This indicates the Happy ending of Summer Surprise. Who knows if they still are providing the Summer Surprise Offer secretly 🙂 . For more facts, please visit JIO Summer Surprise Offer is not ENDED Yet. Hurry – get it NOW. This may be the full planned promotional stunt by JIO team. We guess, JIO has requested TRAI to issue given advisory / directives any of their rights 🙂 . Hard to believe that the “Responsive 24/7 – JIO Twitter Care” is on silence after releasing the “secret message” to JIO community after 6th April,2017. We hope you have loved our investigations about the END of JIO’s Summer Surprise Offer. Please do share your opinion about these happening under the comments section below. JIO is never going to END their surprises 🙂 , once they release any more of them, we will be covering the same for our community. Till then, Bye Bye. have a fantastic day.